Why all actors should consider a side hustle in marketing. A breakdown of tools, strategies and life hacks you might be missing for all your digital marketing campaigns. As an independent contractor, having a web presence has never been so important. When I graduated from Boston University in May, I didn't have a direction to take my life. I had booked a show over the summer that opened doors to take my career, but as the realization of student loan repayments dawned on me I couldn't sustain myself as a theatre artist alone-- at least not right out the door. By the end of the summer and many early mornings spent sending emails and making phone calls, I had somehow secured a marketing job at a small startup company in New York that manufactured standing desks with no former experience in marketing at all. And just like that I had health insurance, dental, and was making $700 a week with a flexible schedule. Now going into the job I knew I had a lot of homework. I had no idea what a marketing job even was- yeah I was good at tumblr, but making gifs of standing desks wasn't going to sell them. My boss told me later that he had hired me not because of my experience but because I had a creative approach to problem solving and a methodical approach to solving problems unconventionally-- a skill I refined during my training as an actor. So I packed up my bags and moved to New York City. The first month at the job was a train wreck. I made many mistakes and spent all my free time figuring what it was I was supposed to be doing. I read book after book on marketing in my free time- A Marketing Principal textbook, From Zero to One, The Power of Habit, a fashion marketing & communications text book- anything to get myself into the head of someone who had this job. While all this was happening, my boss was layering on more and more responsibility. By the end of my first month, I had learned how to 1. organize a social media content calendar with an international team 2. optimize content for search engines 3. respond as a journalist and writer for the company, organizing my own interviews with professors at universities, executives at Uber, and researchers at medical institutions like John Hopkins. By the time I changed jobs, I was in charge of creating my own ad campaigns, organizing and reporting my devised growth models, and strategizing decisions based off our website analytics. So why is all this important for actors? Because the thing they don't teach you in school is how to market yourself for the year of 2018. The following is a list of tools you can use to your advantage to get ahead of the game. SEO is a big buzzword when it comes to the world of marketing; some people enjoy it, some people hate it, and a lot of people don't understand what it means. SEO or Search Engine Optimization is how your website, page, blog ranks in a search engine's index. Whether you pursue optimizing your website for Google, Bing or whoever, the fact remains: you need a web presence. A lot of people opt for creating a website- such as myself- to archive their materials as an artist. You can host your demo reels, head shots, talk about your current or recent events- but most importantly you give yourself a metric for seeing who's looking at you. So great I have website. It has material. How do I get people to see it? The way google's algorithm works is by pairing key search words, colloquially referred to as "keywords" to relevant websites. There are short tail keywords like 'actor' or 'new york' and there are long tail key words like 'New York based film, television and theatre actor' that you'll want to capitalize on. If you're promoting your website dry, meaning you're trying to generate organic searches without a budget, simply refining the popular keywords on your website will be sufficient. How do I know what words are popular? There are several tools if you want to invest the time and possible money. Google Adwords provides any user with a list of free keywords. My favorite method is a little more focused on working from the ground up: check your competitors. 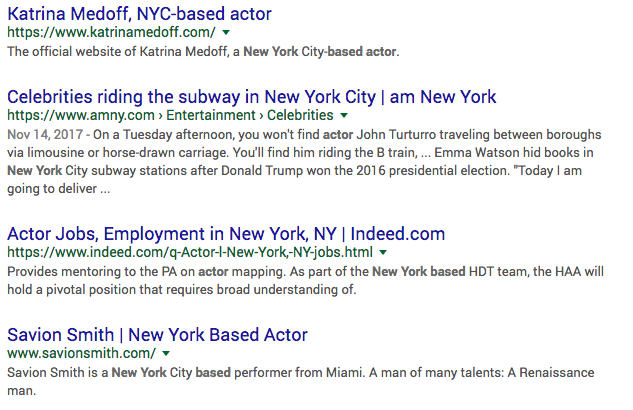 Tag a search with 'NYC based actor' and see what you find. A quick search brings me these results. What's important to know is that statistically most searches will click on the first domain that pops up, so refining your niche is really important. Look at the blue text- this is called an SEO title and is the most important information for the search engine to register, so it needs to be specific. Popular keywords are 'free' 'get' 'shop' 'discover' shipping' 'buy' and those are hard to target for an actor. Now you could stuff your header with keywords like 'Explore New York Based Actor, SAG AFTRA, Television- Sean McCoy' but that can actually penalize you. So it's important for your header title to include a concise keyword or two but to also include your name. Now the part of wording below the blue text is what is referred to as a meta description. Your meta description is used to inform readers about where your link is taking them. Often times your meta descriptions will copy the first text on the page, but you can modify these in your settings. Write something you think people would click on! Be human! Or informative! Search Engines don't look at that so write for the human. If you're like me, you thought companies were keeping blogs because they like writing about important things happening in their industry. While thats true, there's an alternative motive to blogging that can strategically help you market yourself as an actor. Most important is the concept of backlinking. There are types of domains that have a higher hierarchy when it comes to search engines. EDU domains are one of them, but larger profile companies are also useful. So when you're blogging, seek content that's relevant to your industry but also might feature your content that they could then backlink to your website. Another strategy to do this is to enlist yourself as a content creator. When a company updates their website with photos, articles, or content you've generated for them, having a website gives you the opportunity to backlink your site on their domain, effectively increasing your SEO ranking. Not only is this great organic publicity, but it's also an effective way to increase your relevance and visibility to google while creating a versatile relationship with a company or organization. After all, it's who you know that gets you hired. If all thats tiring to you, having a blog gives you another opportunity to log important keywords for your site. You can write about literally anything as long as you find a way to tag valuable keywords in what you make. Emails, emails, emails! Probably the most iconic part of any marketing job is its relationship to email marketing. The same is true this day in age for actors submitting themselves to roles. If you know how to write emails, you know how to reach the people you need to get to. I try to send at least 200 hundred emails out a week to relevant connections in the industry- maybe it's a follow up, maybe it's a cold outreach with a resume/headshot, or maybe it's a question I have about a listing, their season or work they've done. Regardless, sending out these emails isn't just an attempt to communicate- it's research for the most effective and efficient ways to reach people. The thing to remember about marketing is that nobody wants to be marketed to. If you start an email out just talking about yourself and what you bring to the table there's no demonstrated interest in the other party. It's blatant solicitation and nothing could be more of a turn off. While emailing is tedious, you can simplify by drafting templates for yourself and fill in the gaps with the personalized bits. But put in the work to learn about who you're talking too- it's an investment not an instant gratification. I have thousands upon thousands of unopened or disregarded emails. Thousands. But with each successful response my turn over rate gets higher because I understand why people are responding. Everyone is human and everyone wants to be treated as such. I'd say really any social media platform is important to have, but I'd probably be lying. As a marketer, the first place I look when I'm looking to cast projects or to network influencers is instagram. It's not important to have a million followers because honest to god Instagram's algorithm works against your favor-- but have some type of presence. I've been offered work from instagram, people I know have been cast in projects off of instagram and as a photographer I seek out people to work with via instagram because it's easy and gives me all the information I need. It's quick, its visual and more and more casting networks are using instagram to scout their actors. There are several things you can do to grow your instagram like tagging, commenting, liking, reposting etc. I won't get into that because it's self explanatory and notoriously difficult. But most solutions are about strategic timing and knowing when your followers are active (the most popular hour ever on IG is 5pm EST on Wednesday just FYI). It's now been six months since I journeyed to New York. I have a part time job in the fashion industry as a Lead Marketing Strategist where I can make my own hours and I get paid enough to supplement my expenses. My photography is used in banner ads, represented on E-Commerce channels, and advertised on paid social channels. As an actor, I've signed with a wonderful management company, booked my own work in film, been able to book my friends in projects with the companies I've worked for and I average about 100 visits to my website a day organically. My position as a marketer puts me in a place where I can organize $50,000 fundraisers for organizations that are making an impact like the Breast Cancer Research Foundation. The skills I've gained and the projects I've managed qualify me for positions at companies with a $70k salary- at 23! There's room to grow, there's (more and more) challenges everyday, and it's an excellent environment to hone my creative problem solving skills. You couldn't have paid me enough money this time last year to believe I'd have adopted a side hustle in marketing, but I'm glad I've learned what I have. There's an incredible amount of knowledge for actors to pull from to improve their relationship with the digital age. Got a question about the article? Send it my way!